Every day after school, his son would leave the house with a backpack, his dog, and go for a walk. Every day, he would come, a little dirty, but happy. Then one day, dad decided to follow his son with a camera and captured pure magic! 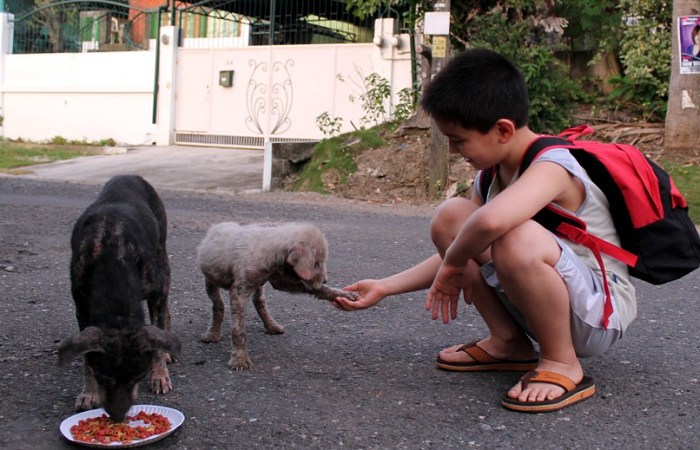 In the Philippines, these stray dogs have a rough life. Skin conditions, starvation, dehydration, and various injuries can go untreated for long periods of time if no one steps in. His son couldn’t do much about their medical needs, but he could give the little pack of dogs something to help: friendship and a meal! There were usually four stray dogs, a family, but on this day there were only three. When he first began to feed the strays, they would never come very close at all. Now, they are still very hesitant, but they don’t wait for him to walk away before they come close enough to eat. The little white dog had been taught by someone how to “raise his paw” and will often greet his son with a small gesture! 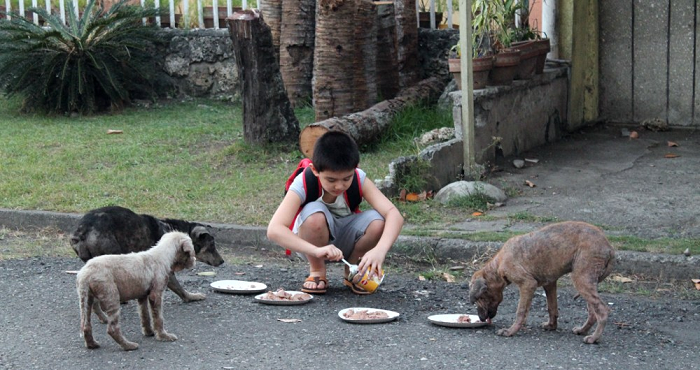 The little dogs get one meal, a little kindness, and the strength to survive another day! He was very proud of his son and thought that the world needed to know just how inspiring he was. To these four dogs, at least, he was a hero.